It's official - Pope Francis will participate in the upcoming World Youth Day 2019 in Panama, the Vatican has confirmed. Source: Vatican News. Director of the Holy See Press Office, Greg Burke, confirmed the Holy Father will arrive at the event a day after it begins and take part from the 23rd to the 27th of January. This will be the third World Youth Day (WYD) Pope Francis attends. His first took place in Brazil in 2013, just months after his election to the papacy, followed by Poland in 2016. 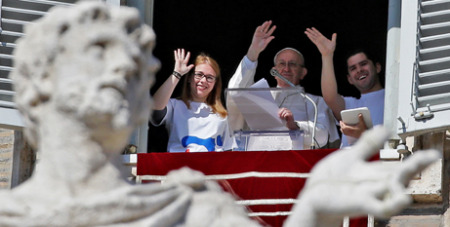 The Vatican’s announcement made the visit official, but Pope Francis had previously registered online for WYD at the Sunday Angelus on February 11, the day registration for the event opened. As he overlooked St Peter’s Square, the Pope held a tablet and signed up for the event. “There,” he said. “I am now enrolled as a pilgrim to World Youth Day.” And he invited young people around the world “to live this event of grace and fraternity with faith and enthusiasm, either by going to Panama or by participating in their communities”. In March 2017, Pope Francis released a video message for the 2019 event, inviting young people to look to the Blessed Virgin Mary as they continue their pilgrimage toward the event. “Mary did not stay at home because she was not a young couch potato who looks for comfort and safety where nobody can bother them. She was moved by faith because faith is at the heart of Our Mother’s entire life story,” he said in the video. Malcolm Hart, Director of the Australian Catholic Bishops Conference Office for Youth, welcomed the confirmation that the Pope would attend WYD and said Australians wishing to attend WYD in Panama should express their interest at http://www.wydpanama2019.com.au.